Summary: Elizabeth Rew’s life has all the elements of a good fairy tale. Her mother has died; her father has remarried so that she now has a stepmother and two college-age stepsisters. While the stepmother and stepsisters are not evil, they do take advantage of Elizabeth. She has had to transfer to a new high school where she has no friends. A research paper she does on Grimm’s fairy tales for her history teacher leads to an after-school job as a page at a very unusual library. The New York Circulating Material Repository is a lending library of objects rather than books—objects both contemporary and historical (such as Marie Antoinette’s wig), common and obscure. She learns that the basement houses several secret collections including the Grimm Collection, a room full of magical items mentioned in Grimm’s fairy tales. She is intrigued by the seven-league boots, a mermaid’s comb, the magic mirror belonging to Snow White’s stepmother, and other items. But some of the items are disappearing and others are losing their magical qualities. Elizabeth and her fellow pages are suspects. Even though the pages don’t completely trust each other, they set off on a dangerous and exciting quest to find the real culprit. Literary Elements at work in the story: Even though The Grimm Legacy is fantasy, it remains grounded in reality. Problems are not solved through the use of magic. In fact, some of the magical items cause more problems than they solve. Missteps while wearing the seven-league boots can cause the wearer to crash into walls or ended up far from their intended destination. The magic mirror must tell the truth but can be snide and catty in its responses (saying that Elizabeth is brave and true, but not pretty, for example). The four teen-age protagonists have problems with which the reader can identify: being an outsider at a new school, being jealous or envious of others, having a pesky younger sibling, family problems, etc. Perspective on gender/race/culture/economic/ability: The four teen-age main characters are of different ethnicities. But their ethnicity is merely a factor that describes appearance, much in the same way that someone would be described as having brown eyes or curly hair. The ethnicity does not describe abilities or character traits. The girls and the boys are equally brave and compassionate. The girls have initiative and are willing to risk safety to rescue others who are in danger. Marc, the high school basketball star, takes care of his three-year-old brother with caring and without embarrassment or resentment. Elizabeth’s father does not seem to pay much attention to her. Why? What would you say to him? What could you say in his defense? How do Elizabeth, Marc, Aaron, and Anjali honor and respect their parents? If you could borrow an item from the Grimm Collection, what would you want? Why? What would you leave as a deposit? How would this affect your daily life? Because the main characters do not know whom to trust, they find it difficult to work together to find the thief. Why do we sometimes find it difficult to work together? What are some advantages of working together? Elizabeth has strong memories of her mother and their shared love of fairy tales. What memories do you have of an activity shared with a parent or grandparent? Where is God at work in this book? This review is written by Union Presbyterian Seminary graduate Mary Anne Welch. 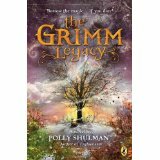 The Grimm Legacy by Storypath is licensed under a Creative Commons Attribution-NonCommercial 4.0 International License.